Obama senior campaign adviser David Axelrod told CNN’s Candy Crowley that the campaign never said that Mitt Romney was a felon, only that he might have committed a felony in the signing of SEC documents. 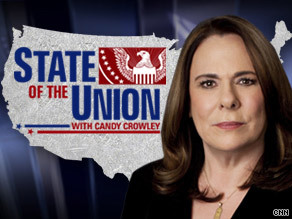 Axelrod appeared Sunday on State of the Union and was asked by Candy Crowley whether or not he thought Romney was a felon. Crowley: Let me ask you, your deputy campaign manager Stephanie Cutter said this week that the SEC documents show that Mitt Romney is either a felon or he’s lying to the American people. Do you think it’s possible Mitt Romney is a felon? Axelrod: Actually that’s not what she said, Candy, and I was listening to the call when she spoke. She said, if he was in fact not the chief executive, the president, the sole shareholder and chairman of the company at the time, and that’s what was filed, that would be a felony. She didn’t say he was a felon. That wasn’t a satisfactory enough answer for Crowley, so she pressed Axelrod some more on the issue. Axelrod in turn shifted to saying that Romney may not have misrepresented himself in the filings, but if not, he was misleading the public on his business record and that he was willing to give Romney the benefit of the doubt. Axelrod was technically correct about Cutter’s remarks. Even though she didn’t directly call Romney a felon, her suggestion that he might have committed a felony certainly implied that he was and Axelrod knows full well what she meant. Any attempt to deny it is nothing short of disingenuousness on the part of the campaign. Take your pick, they’re saying, Romney is a liar or a felon.